A radiofrequency ablation is a procedure used to destroy nerve fibers that carry pain signals to the brain. 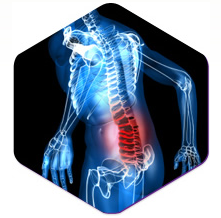 Called RFA, this procedure can give long-lasting pain relief for people with chronic low back, neck, and joint pain. 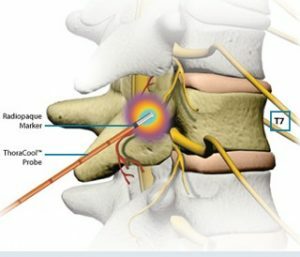 Radiofrequency ablation, also called a rhizotomy, is a minimally invasive procedure that utilizes heat to destroy a portion of the nerve. The radiofrequency energy ablate (burn) the nerve that causes the pain, and this stops nerve signal transmission. What conditions are treated using radiofrequency ablation? Who is a candidate for the RFA procedure? RFA is used for patients who have not had successful pain relief with other treatments. It is best for those who had successful pain relief with a diagnostic nerve block injection. Candidates should not have an active infection, be on chemotherapy, or suffer from a severe heart condition. Candidates should be in good health, be optimistic regarding treatment, and wish to follow medical advice. What happens before RFA treatment? The doctor will review your medical history, current medication list, and previous imaging studies. In addition, you must stop taking blood thinning agents for 5-7 days before your appointment. The procedure is scheduled as an outpatient procedure, and a sedative is used. Be sure to arrange to have someone drive you home. When you arrive for the procedure, a nurse has you change into a gown and places an IV line in your arm. Be sure to leave valuables at home, and wear loose-fitting clothing to your appointment. At the time of your procedure, you are positioned on the treatment table. A sedative (Valium or Versed) is administered. After the injection area is cleaned with an antiseptic, the skin and deeper tissues are numbed with a local anesthetic. With the aid of a special x-ray (fluoroscopy), the doctor directs a thin, hollow needle through the skin and positions it near the targeted nerves. Once in place, a numbing agent is instilled onto the nerves. The catheter is left, and the needle is removed. The radiofrequency probe is inserted through the catheter to create a small, precise burn (lesion) on the nerve. Several nerves may be treated. What can I expect after the RFA procedure? After the treatment, you may have pain for up to 14 days. Some patients have immediate pain relief from the anesthetic, but this wears off in 12-24 hours. You must rest for 2-3 days, and gradually resume usual duties. Be sure to keep your follow-up appointment, and do not drive for 24 hours. When you are in the recovery area, a nurse monitors you for around one hour before discharging you home. What results can I expect with the radiofrequency ablation procedure? According to clinical studies, the radiofrequency ablation is 70-90% effective for people who have had previous successful nerve blocks. In a recent study of patients with cervico-brachial pain, the success rate of RFA was 82%. Another study evaluated patients two months after the RFA. Around 83% of patients treated for lumbosacral radicular pain had improvement of pain scores with the RFA procedure. Simopoulos TT, Kraemer J, Nagda JV, Aner M, Bajwa ZH: Response to pulsed and continuous radiofrequency lesioning of the dorsal root ganglion and segmental nerves in patients with chronic lumbar radicular pain. Pain Physician. 2008, 11: 137-144. Van Zundert J, Patijn J, Kessels A, Lamé I, van Suijlekom H, van Kleef M: Pulsed radiofrequency adjacent to the cervical dorsal root ganglion in chronic cervical radicular pain: a double-blind sham controlled randomized clinical trial. Pain. 2007, 127: 173-182.